For the most part, my gear list stayed the same, but there were a few minor changes, the biggest of which was my decision to leave my 15 F Marmot Helium sleeping bag behind, and instead carry my 35 F Enlightened Equipment Prodigy quilt. Then there were also some clothing changes I made (particularly my base layer), and afterwards, some changes I wish I had made (leaving my boots behind and wearing my trail runners…) Anyway, there were also a number of new items that I carried with me, as well as some items that I had used on previous trips. As I mentioned, the trip offered a somewhat wide range of weather conditions. We had plenty of rain and some sun. We had temps around 50 F and as high as almost 70 F. And we even had some good wind’s blow through camp… In the end, these conditions allowed me to try out some of my gear (new & old) in these less than ideal conditions, which is always fun. So, now that I am back, and my camera has dried out about 90%, I figured I would do a video to talk about a few of those pieces of gear that I carried with me on the trip. And, instead of typing it all out, I made a nice, long, 30 minute video in which I talk about these items. So, if you are interested in listening to me blab about some good ole’ gear talk, check out the video below, and as usual, feel free to comment below! Thanks for watching, and see ya next time! This entry was posted in Gear Reviews and tagged Backpacking, Carbon Fiber Stakes, Cuben Tarp, gear reviews, Gossamer Gear, Hiking, Kindle, LiteTrail Esbit Cook Kit, LT4 Trekking Poles, Mini Groundhog Stakes, Panasonic Lumix Camera, Sorex Stakes, Titanium Skewer Stakes, ZebraLight H51, ZPacks Tarp. Bookmark the permalink. Hi Richard, and thanks for stopping by and commenting! I appreciate it. Great to hear from another Esbit user, and I agree with you, unless I just happen to get to camp super early, I will start my water boiling and then go about setting up the rest of camp. Stick, Thanks for your honest, balanced review of a variety of gear. Reading about your experience has helped me refine my gear list for my upcoming thru hike. I appreciate it! Glad to hear that I have been able to help you out in your preparations for your thru, and good luck on your hike! I have replaced most of my gear with newer lighter gear after having kids. Your website was helpful along with others because the stuff I want is mostly not available locally. Reviews and especially videos are helpful. My wife is ordering Down booties from Ben for my birthday. (Hate auto correct) I want the pants but just bought a hummingbird sleeping bag from feathered friends and an arc blast backpack from zpacks. Both are great companies. I first hiked Rainier in late 60’s in Boy Scouts and got the bug. Am I right in thinking you are coming out to do the wonderland trail. If so you should check the Washington Trails Association web sight for current conditions along the trail. It is what the locals use. Bring your best rain gear no matter what the forecast. We get high pressure systems that set up in summer and fall but our weather tends tochange quickly. On a long hike rain is likely. Rainier tends to be crowded but has wilderness zones where you can find nice camp spots away from people. It gives you more of a wilderness feeling which is sadly lacking at Rainier (well loved park). I am sure you will be on a tight timeline but I have to say that Olympic National park is are crown Jewell in my not so humble opinion. Yes I know many would suggest North Cascades Natioal Park. A side trip to Hurricane Ridge with a stop to pick up bear canisters (sadly required) on the way to the coast. Then a three day trip down a rugged strip of wilderness coast from Oil City to Third Beach (watch the tides) would be worth your trouble. Since you are already on the Hoh River why not drive to the Hoh River trailhead and hike up a temperate rain forest which averages 130-170 inches a year. I should also suggest the Robert L Woods book on the Olympics which has served as our bible for 30 years. Leave the trails behind and use this guide to go cross country. we are going up the Quinalt in February to watch the bull elk gather their harems. In August we are planning to do the Bailey Traverse for the third time. Glad to hear that my blog/videos were helpful for you when upgrading your gear! Thanks for taking the time to let me know, I appreciate it. Congrats on the pack and sleeping bag too. I am contemplating seeing about retrofitting my Blast 30 with the Arc suspension. Not sure if they will do that though, but I would like to try it out simply to help keep my back cool when hiking! That is correct in that I am planning to hike the WT this year, however, it will be in September sometime… I am very much looking forward to getting out there and see it though… this will be my first out-west hike! And thanks for the tips on the weather. I will be doing lots of research in the next few months. Anyway, thanks for stopping by, and good luck with upgrading/lightening your pack! I found your segment on stakes very interesting. I’ve been wondering if the thin shepherds hooks would hold well. You answered that question with good detail. Thanks for another great video. The skewer stakes tend to do a great job along the AT here in the southeast. Reason being, the ground is usually a good mixture of both rock and packed soil. It is quite typical for me to stick the stake in and pull back out and re-angle the stake slightly due to the rocks in the ground. However, these thin skewer stakes will go in much easier than larger stakes, and the hard packed soil, along with the rocks do a great job at holding them in place. For softer soils, they may not perform as well though, however, by simply placing a large rock, or log over the stake should help to secure it. Nice video. Gossamar poles do not get good reviews with us thru-hikers. I have been on the end of many tales concerning bending, snapping or just failure. So much so that the owners swore they wouldn’t buy them again. You cannot fault the weight but I guess it’s just one of those bits of gear where they’ve gone so light that it has sacrificed on quality. Wow, thanks for stopping by! And congrats on your recent thru-hike! I appreciate you stopping by and sharing. I have read many reviews that the Gossamer poles break. Well I have the Yana Poles from Ruta Locura and my buddy does too and no problems whatsoever. We have about 400 miles on them and no issues and I fluctuate between 235-250 lbs when I’m hiking/backpacking. They even survived a 72 mile trip to the top of whitney. Stcik, maybe its time for you to try the Yanas!!! To be fair, if I had been more careful, I would not have put the LT4 in a position to break. It is my opinion that the way it happened, any carbon fiber pole especially would have broken in this situation, and an aluminum pole would have bent. Saying that, I am still happy with my LT4’s. I have thought about the Yana’s for a while, but I was more attracted to the GG poles mostly due to the handle design, and the more simple locking mechanism. I have never had a Yana in my hand, but I have read John Abela’s account of the poles and while I can’t say that the review turned me away, it didn’t really give me reason to spend more on another set of poles. I will also say that other than John’s review, I have not really come across any other reviews of the poles. I haven’t really looked, but it is quite easy to find lots of info on the LT4’s, not so much on the Yana’s. That makes me wonder what the ratio of LT4’s to Yana’s are that are in the field… which could also be a reason that broken Yana’s are unheard of? Anyway, thanks for stopping and commenting! Yes, the windscreen comes with the kit. The kit comes with the cuben stuff sack, the pot & lid, the windscreen & 2 paperclips, the stove and the ground protector. Not sure if he still does, but it also came with 3 of the 14 g Esbit tablets, although, this may be an introductory thing? Not sure. Anyway, thanks for stopping by! I appreciate it. My opinion your videos are very organized and not too long. As far as the Suunto… I actually meant to! I even had it on my wrist as a reminder, but then I forgot… Oh well, I will likely do a review/look at the watch in a couple of weeks. Thanks for the kind words about the length and content of my videos too! I appreciate it. Enjoyed your video as I always do and glad your camera is working. 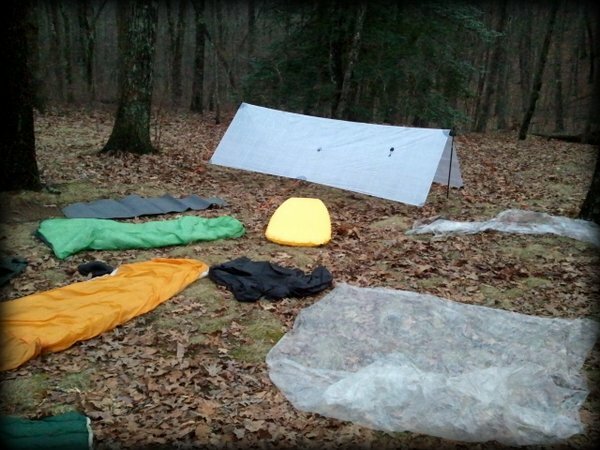 I am considering getting a Zpacks 9×7 tarp and I wondered if you were satisified with the 6.5 width. Also, do you think the panel tie outs are worth having. You said on the second night you didn’t use a panel tie out because you had a nice tight pitch. As far as the panel pull outs, I would suggest getting them as well, especially if you get a flat tarp with no cat-cuts. A cat-cut along the ridgeline will allow you to get a much more taut pitch when pitching the A-Frame, which would eliminate most of the need to use the panel pull outs, however, there may still be times when pulling those panels out will be much appreciated, say when it is pitched low and you are trying to milk it for as much room as possible. But, a cat-cut will limit the way the tarp can be set-up. I wanted to try other pitches, so a flat tarp was the best idea for that.